According to information from Auburn University, Alabama Cooperative Extension System plant pathologists and crops specialists have confirmed the presence of Cotton leaf roll dwarf virus (Cotton Blue Disease or CLRDV-AL) in Alabama. The disease, which is spread by aphids, damaged cotton in 2018 in Alabama counties bordering the Florida Panhandle. Alabama Extension professionals are working alongside their Georgia counterparts to issue guidelines and recommendations to help manage the disease as producers move closer to spring planting. Dr. Austin Hagan, an Alabama Extension plant pathologist, said henbit, a common winter weed, has tested positive for CLRDV-AL, and is a likely host. Hagan said researchers in Alabama and Georgia are sampling winter weeds and some perennials to be tested for the virus. Many no-till and reduced-till fields have already been sprayed for winter weeds. Experts are advising a burn-down herbicide application to kill winter weeds. Live cotton stalks continue to test positive and are possible hosts for CLRDV-AL. The virus was detected in cotton stalks collected in December and January in Baldwin, Dale, Geneva and Macon Counties. Diseased cotton stalks will only serve as a virus source if developing lateral shoots and leaves are infested with the cotton aphid, which could migrate and transmit the virus to a bridge host or early cotton. Without the cotton aphid, no virus transmission from overwintering or bridge hosts occurs. Even if cotton is not sprouting, stalk destruction is still advised. Ideally, said Hagan, cotton stalks should be killed soon with a stalk puller, bush hog, other tillage equipment or herbicides. Sanitation practices such as destroying a potential inoculum source like live cotton stalks and weed hosts, is commonly recommended for reducing the risk of diseases – particularly hard-to-control viruses – from spreading into subsequent cash crops. Hagan said there are still no “hard and fast” guidelines for preventing another outbreak of CLRDV-AL in Alabama cotton. Distribution of this disease in Alabama has been established, along with the identification of possible survival sites and winter weed hosts. In 2018, Blue Disease incidence and severity was noticeably greater in late-planted cotton as opposed to early-planted cotton. The severe stunting in juvenile cotton associated with Blue Disease in Brazil was not observed in affected Alabama cotton in 2018. As a result of mild winter weather and possible overwintering, Hagan said it is possible that disease onset may occur earlier in 2019 than in 2018. 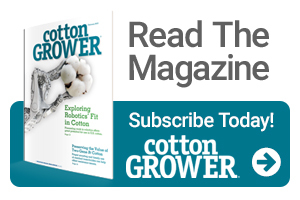 Information related to cotton cultivars and resistant Brazilian lines will not be available until the fall of 2019. Auburn University researchers have initiated virus epidemiology studies, as well as studies into the relationship between the aphid vector and cotton host. Alabama Extension plant pathologist Dr. Kassie Conner has been instrumental in developing techniques for identifying CLRDV-AL in cotton and other plants. She is also providing critical information concerning taxonomy and classification of the virus. Additional information on the onset, severity and distribution of Blue Disease in Alabama cotton will be distributed during the 2019 production year. Based on information from the Alabama Cooperative Extension System.